Thomas Frederick Sweeney, was born in Nottingham on 21st June 1896, the son of Thomas & Mary Emma Sweeney (née Bishop). In 1901 the family was living at 42 Nether Street, Beeston2. Thomas, the father, was born in Ireland about 1869 and was then working in the cycle industry, probably at the Humber Company in Beeston as a filer. 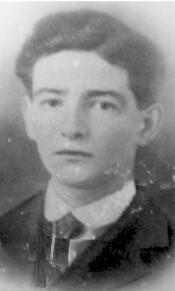 Mary Emma, his mother, was born in Nottingham about 1874. It appears that the family moven to Beeston about 1898 as his sister Annie was born there about 1899 followed by a brother, Bernard about January 1901. Later sisters Catherine (1903), Winifred (1906) and brother Fred (1909) were born. At the time of his death, Thomas & Mary Sweeeney were living at 40 Upper Regent Street. The Boys Brigade Register shows him joining the new association on October 11th 1909 at the age of 13. He was then working in his first year at Lenton skin-yard which must have been a tough task for one so young. He must have left there because his place of work was the Ericsson Factory when he left to join the army. Thomas Sweeney joined the Sherwood Foresters in 1914 and was posted to the 3rd Battalion and after early training transferred to the 2nd Battalion Cheshire Regiment to get to the front and be involved in what he enlisted for. At the commencement of hostilities in August 1914, the 2nd Battalion Cheshire Regiment was serving in Jubbulpore in India. Due to the situation in Europe the battalion returned to England, landing at Davenport on 24th December 1914. The Battalion was then attached to the 84th Brigade 28th Division at Winchester. After further training the battalion final arrived at Le Havre in France. The British attack at Loos in September 1915 was to be launched by six divisions from Douglas Haig's First Army. The attack was preceded by a four day bombardment and would see the first use of poisoned gas by the British. The chlorine gas would be a great disappointment. It was released at 5.50am, giving it forty minutes to do its work before the infantry attacked at 6.30. However, much of the gas either lingered in no mans land or drifted back over the British lines. Despite this setback, the first British assault was a success. The fighting subsided on September 28th with the British having retreated to their starting positions. The British attacks had cost over 20,000 casualties, including three Divisional Commanders; George Theisiger, Thompson Capper, and Frederick Wing. Following the initial attacks by the British, the Germans made steady attempts to recapture the Hohenzollern Redoubt. This was accomplished on October 3rd. On October 8th the Germans attempted to recapture much of the lost ground by launching a major offensive along the entire line, but abandoned the effort by nightfall due to heavy losses. Estimates of enemy losses vary, but the most common figure is a total of 25,000, half the British figure. The autumn battles of 1915 all ended in a similar tale of Allied failure and heavy losses. Sir John French was a casualty of the battle. The confusion over the reserves combined with a determined campaign by Douglas Haig resulted in his removal as commander of the BEF. On 16 December Douglas Haig was appointed to command the BEF, a post he would hold for the rest of the war. 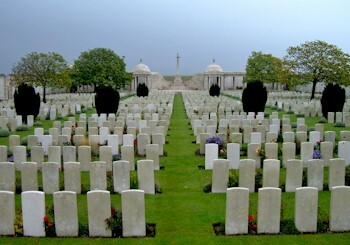 Among the dead on the British side were Fergus Bowes-Lyon, brother Elizabeth Bowes-Lyon (later Queen consort of George VI and "Queen Mother") and John Kipling, the son of the author and poet Rudyard Kipling. Private Sweeney was reported missing believed killed-in-action on 2nd October 1915. His name is commemorated on the Loos Memorial, This commemorates over 20,000 officers and men who fell in the battle and have no known grave.